My dad is impossible to buy for. He. Has. Everything. He’s always gracious but he’s just not the type of person with a lot of wants in life. Which makes gift giving a challenge. 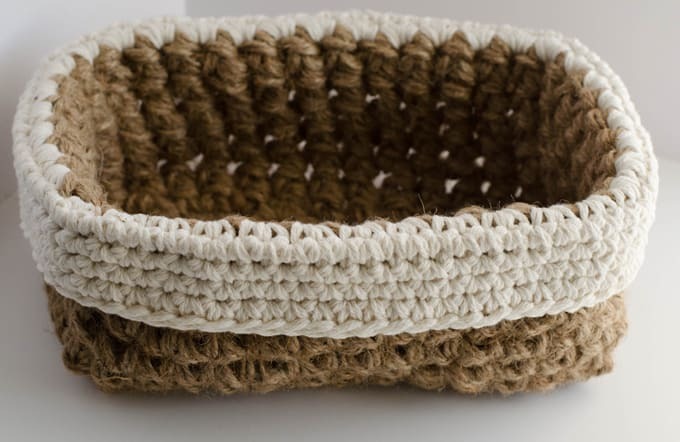 This year I decided to design a crochet jute basket pattern. Super easy and so fun. I filled it with 2 movies, some microwave popcorn and two mini bottles of wine. I’ll be honest… the mini wine bottles came in a 4 pack.. two of them MIGHT have accidentally on purpose been consumed by a certain crocheter. Gulp. Well.. you know what they say… give what you love. And I do love this jute basket. You guys… you won’t even believe how easy this is to make and super fast! Note: I used 2 balls of worsted weight cotton yarn and 2 balls of Natural Jute twine. I bought the Jute twine at Hobby Lobby. You use 2 strands at a time. You could probably get one ball of each if you were willing to unwind half so you could use 2 strands at once. That seemed like way too much work for me, so I went ahead and bought 2 of each. You will also need 2 crochet hooks: size I and size P. Size P is a big plastic hook. You can adjust this to any size rectangle or square you want. This is about the size of an oblong facial tissue box. R2-7: sc across, ch 1 and turn (12 st). R9-14: ch1, sc around, sl st to 1st st (38 st). 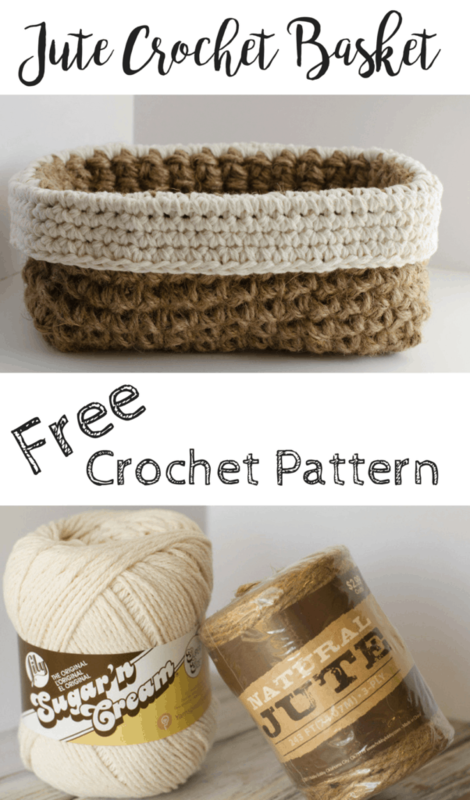 Fasten off the Jute twine and say goodbye to that plastic size P hook! Now you will use 2 strands of cotton yarn and the I crochet hook. Since you will end up flipping this down over the basket and you want the finished edge to be on the right side, flip your work around so you are working with the inside of the basket facing you. Attach the cotton yarn to any stitch on the short side and ch 1. Flip the trim piece over and see what you think. Work 1 or 2 more rounds if you want. Fasten off and weave in the ends. There you go! 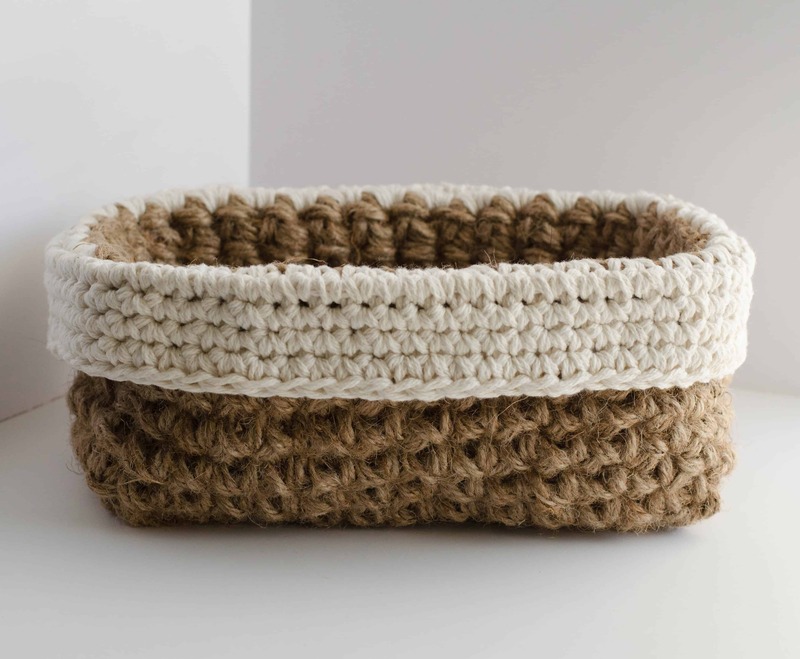 One cute rectangle crochet jute basket to hold all your goodies! 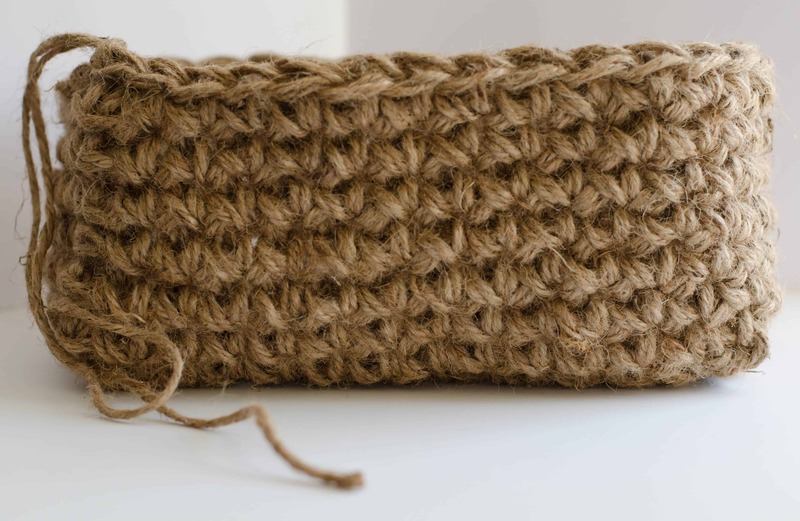 I hope you enjoyed this crochet jute basket pattern. Please pin and share with your friends! Hi Rachel, I forgot to take measurements before gifting to my dad. Oops. But I used my facial tissue box as a template (and it turns out that is what he is storing in the basket). My best guess is that it is about 9.5 inches long by 5.5 inches wide and about 4.5 inches tall. When I go over there next, I will measure it and get you exact measurements of the finished basket. Well that’s embarrassing. Yes, it should 38. I corrected the pattern. It was wrong in my handwritten notes (wrote the numbers down in a line just like you do in 3rd grade and apparently my 3rd grade, no calculator, skills were rustier than I thought) Sorry about that! Love this! I’ve made round baskets but never thought to try straight edges. Thanks! I just wanted to tell you how much I enjoy receiving your emails. For me, it feels like sitting down with a crocheting bestie each day, drinking coffee & having a gab session. Your emails are a pleasure & I look forward to seeing them in my inbox. I am disabled & living on a very small fixed income…..so, your free patterns are a blessing which I greatly appreciate. 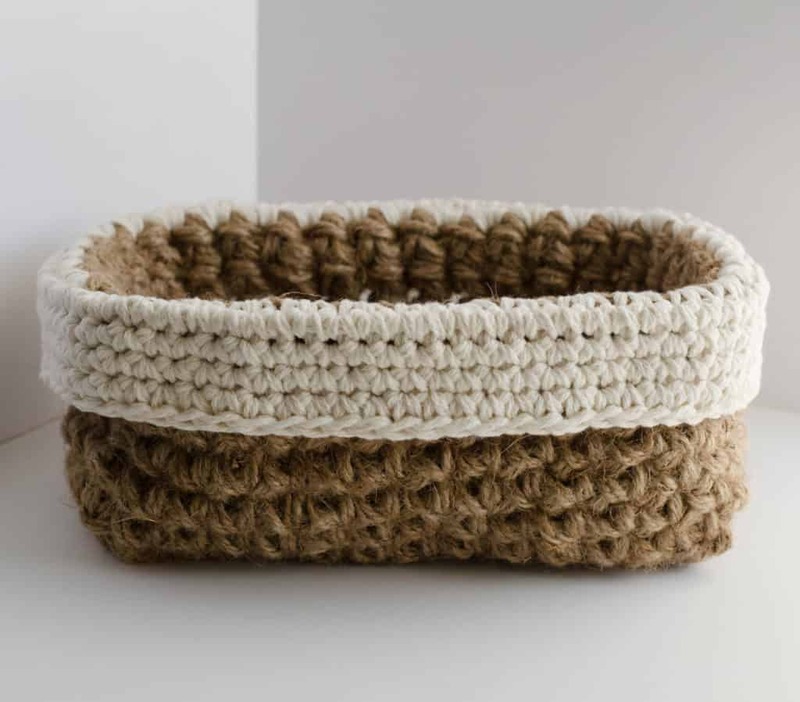 Thank you for sharing them with us each week….Loving this Jute basket, also!! I just finished reading through the Flat Braid Join tutorial. Your instructions are so clear & well explained!! Thank you for sharing them with all of us. And thank you for your blog! As I said, it is a pleasure to read the posts. Aww.. thank you so much, Deb! You made my day! It’s nice to know there are people like you reading what I write and getting some joy from it. Thank you for leaving such a sweet comment! 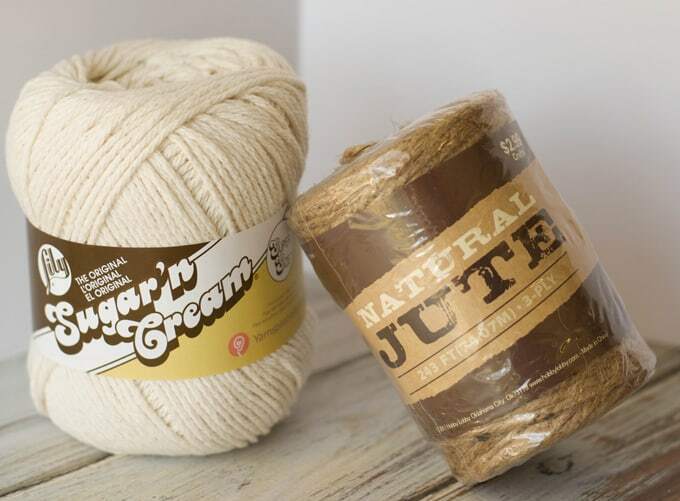 Do you use all of the jute from two rolls for one basket? I have two 200ft rolls. Noticed your roll was 243ft. Thank you! You absolutely can! It is a very flexible pattern!